What is the first thing you do when you are faced with a huge challenge, problem, tribulation, or temptation? The truthful answer for most of us is that we respond to the natural fear that comes with the situation and we immediately begin to plan our exit from it using whatever means available to us. Many times, this just leads to more problems because we make decisions based on fear rather than faith. In todays message, Jehoshaphat shows us that the has learned from previous mistakes and makes a mental and spiritual decision to seek the Lord first. Before we can advance forward through adversity, we have to advance in place by turning ourselves away from fear and completely toward God while releasing our control of the outcome. 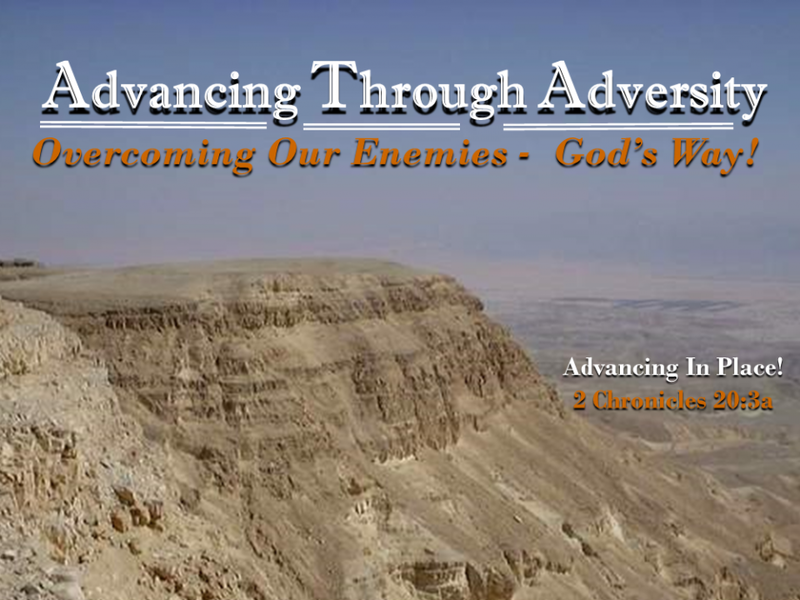 In 2nd Chronicles, we find the amazing story of Jehoshaphat, a man of God following in the footsteps of his Father who was also one of the righteous kings of Judah. Yet, in chapter 20, he faces adversity and has to decide how he will handle that adversity. He learns his lesson from a previous failure and He decides this time to advance through adversity God’s way. What about you? When you have to deal with trials, tribulations, temptations – how do you deal with them? Adversity happens – everyone has to face it, the question remains – how will we deal with adversity.